HOUSTON – Dave Campbell’s Texas Football, the leading publication for all things football in Texas, and the Academy Sports + Outdoors Texas Bowl proudly announce the 100-player Watch List for the Mr. Texas Football High School Player of the Year Award presented by Wells Fargo. The voters, when appropriate, will add players to the watch list. Mr. Texas Football presented by Wells Fargo annually recognizes the most outstanding high school football player in the state of Texas. Each week, fans are given a chance to vote for the player of the week on www.texasfootball.com. At the end of the high school football season, 10 finalists will be named. Fans can then cast their vote as to who should be named Mr. Texas Football. The winner of the 2018 Mr. Texas Football Award presented by Wells Fargo will be announced prior to the 2018 Academy Sports + Outdoors Texas Bowl, which will be played on Thursday, Dec. 27 at NRG Stadium in Houston. Former winners of the award include 2012 Heisman Trophy winner Johnny Manziel (2010 winner, Kerrville Tivy), Oklahoma quarterback Kyler Murray (2013 and 2014 winner, Allen) former Texas Longhorns running back Johnathan Gray (2011 winner, Aledo), Tampa Bay Buccaneers running back Jacquizz Rodgers (2007 winner, Lamar Consolidated) and Carolina Panthers quarterback Garrett Gilbert (2008 winner, Lake Travis). Oklahoma State freshman quarterback Spencer Sanders took home the award in 2017. The 2018 Academy Sports + Outdoors Texas Bowl will once again feature a matchup between Big 12 and SEC opponents. The 2017 Texas Bowl, which was among the top-5 most-attended bowls in the country for the fourth consecutive year, featured the Texas Longhorns, representing the Big 12 Conference, and the Missouri Tigers, representing the SEC. The Longhorns defeated the Tigers 33-16 behind a virtuoso performance by the Horns defense. Overall, the Academy Sports + Outdoors Texas Bowl has ranked fourth in attendance since 2014, trailing only the Rose, Cotton and Peach Bowls in that time. For more information on the Mr. Texas Football Award, visit http://www.academytexasbowl.com/ or www.texasfootball.com. The Academy Sports + Outdoors Texas Bowl is owned and operated by ESPN Events, a subsidiary of ESPN, and managed locally by Lone Star Sports & Entertainment. The Bowl will showcase teams from the Big 12 and the SEC, two of the country’s premier conferences, for the next three years. The Academy Sports + Outdoors Texas Bowl has been a tremendous success both on and off the field over its first 12 years as it is the 4th most-attended bowl in the country since 2014. The bowl generates nearly $50 million annually for the Houston economy and has donated more than $1,200,000 in financial support and millions more in promotional support to DePelchin Children’s Center, the bowl’s official charitable beneficiary. For nearly 60 years, Dave Campbell’s Texas Football has been “the bible” to millions of football fans across the Lone Star State. The annual summer edition of the magazine remains a rite of passage for all Texans, previewing every football team in the state — from the rabid world of Texas high school football, through the college ranks, and into the Dallas Cowboys and the Houston Texans. Over the course of six decades, Dave Campbell’s Texas Football remains the undisputed leader in Texas high school football, Texas college football and more. TexasFootball.com is the online home of Dave Campbell’s Texas Football, covering high school football, college football and recruiting all across the Lone Star State. From thought-provoking commentary to videos to podcasts to its daily live show, nobody covers football in Texas like TexasFootball.com. HOUSTON – Texas Tech University and University of Mississippi will have two of their most renowned alumni serve as honorary captains when the two schools face off in the 2018 AdvoCare Texas Kickoff at NRG Stadium on Saturday, Sept. 1. Former Ole Miss running back Deuce McAllister and former Texas Tech wide receiver and running back Wes Welker will represent their schools at midfield prior to kickoff at 11 a.m. CT.
Deuce McAllister is the only player in the history of Ole Miss Football to record three seasons with over 1,000 all-purpose yards. He finished his college career as the programs leading rusher and touchdown scorer with 3,060 yards and 41 touchdowns. He was named to the All-Southeastern Conference twice in 1999 and 2000. During the 2001 Draft, McAllister was the 23rd over-all draft pick by the New Orleans Saints. He went on to rush for over 1,000 yards in three straight seasons for the Saints, which was a first in the history of the organization. Throughout his 10 years with the organization, two-time Pro Bowl selection played in 97 games, had 1,429 rush attempts for 6,096 yards, scored 55 touchdowns and completed 234 receptions for 1,720 yards. McAllister set the all-time rushing touchdown record for the Saints in 2008 and he holds the all-time New Orleans Saints record for most career rushing yards and touchdowns. Wes Welker played college football at Texas Tech, where he totaled 259 receptions for 3,069 yards and 21 touchdowns. Welker also ran the ball 79 carries for 559 yards and two touchdowns. He started nearly every game as a Red Raider, left as a leading receiver in school history, was named first-team All-Big 12 in 2002 and ‘03 and was one of the top punt returners in NCAA history. In 2003, he was recognized for his talent and was honored with the Mosi Tatupu Award as the College Football Special Teams Player of the Year. Welker was signed by the San Diego Chargers as an undrafted free agent in 2004. He also played for the Dolphins, Patriots, Broncos and the Rams. After six seasons in New England, Welker holds the second all-time receiving record for the Patriots, having been targeted 926 times with 672 receptions. He totaled 7,459 yards and 37 touchdowns and holds the fourth highest single-season reception totals in Patriots’ history. In week 7 in 2014 with the Broncos, Welker passed Rod Smith for the most receptions by an undrafted player in NFL history. During his 12 seasons in the NFL, Welker had three Super Bowl appearances, five consecutive NFL Pro Bowl honors and four NFL All-Pro honors. He finished with 903 receptions for 9,924 yards and 50 touchdowns. Tickets are still available. Please note that the NFL Clear Bag Policy will be in effect. For more information, visit www.advocaretexaskickoff.com. The game will be televised nationally on ESPN and heard locally on SportsRadio 610 (KILT-AM). HOUSTON – The AdvoCare Texas Kickoff announced today the game day will get underway with a performance by Texas rock-infused, country artist, Sam Riggs at the Karbach Love Street TexFest on Saturday, Sept. 1. The artist, originating from St. Cloud, Florida, has created two albums and two EPs (extended play record) on his own dime since 2010. Riggs’ last album – the 2016 release Breathless – debuted at No. 12 on the Billboard Country Albums chart. Riggs’ passion for music began at a young age when his mother would play the guitar for him and his brothers before bed, and solidified after attending a Garth Brooks concert with his father. Not long after high school ended, Riggs headed to the Lone Star State to pursue his dreams. The artist picked up a welding job to fund himself and enrolled himself at Austin Community College, where he took a songwriting course. With the help of his professor, he realized he needed to be out there doing it for himself. Riggs sold his welding equipment, his truck and invested the money to make his second EP. Since then, he has racked up 2.2 million streams on Spotify and a number of his singles hit the upper levels of the Texas charts, including the ultra-country “Hold On A Let Go,” the thumping concert re-creation “High On A Country Song” and his vulnerable “Second Hand Smoke.” To top it off, Riggs picked up the Texas Regional Radio Award in 2016 for Top New Male Vocalist. The weekend’s festivities will begin Friday night in Midtown at the Karbach Hopadillo Kickoff Crawl on Friday, August 31 where attendees will have the chance to participate in multiple giveaways as they make their way around select bars in Midtown. The night’s giveaways include AdvoCare Texas Kickoff tickets and swag, passes for a meet and greet with Sam Riggs, pregame sideline passes – all of which can be won through games at each bar. At the end of the night, a final drawing for two 50-yard line AdvoCare Texas Kickoff game tickets at the last bar of the crawl. Sports Radio 610 will be broadcasting live from Little Woodrow’s from 7 p.m. – 11 p.m. CT.
On game day, Karbach Love Street TexFest will kick off the events at NRG Stadium on Saturday, Sept. 1 starting at 8:00 a.m. CT outside the south entrances of NRG Stadium. The event is headlined by Sam Riggs, who will hit the stage at 9:05 a.m. CT following the team arrivals and Spirit Walks. Karbach Love Street TexFest is a free event open to all 2018 AdvoCare Texas Kickoff ticketholders that features live music, prizes and the teams’ spirit walks into NRG Stadium. The official pregame party for the AdvoCare Texas Kickoff will be held outside the South Entrances to NRG Stadium between the Amegy Bank Gate and Ford Gate. This year’s festivities will include food trucks, games, inflatables in the Kids Zone, drink specials and pet adoption from the SPCA Houston by Papa’s Pets. For more information on the event, visit www.advocaretexaskickoff.com. The matchup of the Red Raiders and the Rebels will kick off at 11 a.m. CT following the pregame festivities at NRG Stadium. The game will be televised nationally on ESPN and heard locally on Sports Radio 610 (KILT-AM). Tickets remain for the 2018 AdvoCare Texas Kickoff and are available by clicking here or calling (832) 667-2390. HOUSTON – Media members interested in covering the 2018 AdvoCare Texas Kickoff may now apply for credentials through the game’s online application system. Applications will be accepted until 5 p.m. CT on Wednesday, Aug. 29. The 2018 AdvoCare Texas Kickoff will feature the Texas Tech Red Raiders and the Ole Miss Rebels. The game will be played on Saturday, Sept. 1 at NRG Stadium and will be televised nationally on ESPN at 11 a.m. CT.
Only recognized news organizations will be credentialed. The AdvoCare Texas Kickoff will not credential freelance reporters or photographers not on specific assignment by a recognized outlet. Freelance reporters or photographers working on assignment must have their editor submit an application on their behalf. HOUSTON – The 2018 AdvoCare Texas Kickoff featuring Texas Tech vs. Ole Miss will kick off the first Saturday of the college football season on Saturday, Sept. 1, at 11 a.m. CT. This Big 12/SEC showdown will be played at NRG Stadium in Houston, and will be televised nationally on ESPN. The game will also be carried nationally on radio by Westwood One affiliates including Sports Radio 610 (KILT-AM) in Houston. The AdvoCare Texas Kickoff will mark the sixth match-up in the schools’ histories, continuing the tradition of championship caliber opponents facing off at NRG Stadium. Ole Miss owns a 3-2 record against Texas Tech. The two teams first met in 1986 with their most recent meeting in the 2009 Cotton Bowl where the Rebels beat the Red Raiders 47-34. The 2018 AdvoCare Texas Kickoff will mark the sixth year of an eight year agreement between Lone Star Sports & Entertainment and ESPN Events, a subsidiary of ESPN, to bring a top college football game to NRG Stadium during Labor Day weekend to start the college football season. Tickets start at $43 and may be purchased online at www.ticketmaster.com or by calling 832-667-2390. A limited number of luxury suites are still available, to purchase call 832-667-2160. Tickets are also available at the NRG Stadium box office. For more information, please visit www.AdvoCareTexasKickoff.com. On running the ball 57 times tonight? How do the young wide receivers look? What are your thoughts on tonight’s performance on offense? How did you feel tonight? Was it planned to run that many times? How much more offense is there? What did you see from the freshmen and what did you expect? Was this beyond even your best expectations, under 100 yards surrendered – How good was this from your standpoint? Was tonight a direct result of work put in over the summer? Tonight you faced a great defense, can you comment on how you feel that went? You gave up two touchdowns and then you have a break until the field goal, why do you think you struggled stopping them? NEW ORLEANS, LA – Due to the devastating impact of Hurricane Harvey to Houston and the surrounding areas, the 2017 AdvoCare Texas Kickoff between LSU and BYU has been relocated to the Mercedes-Benz Superdome in New Orleans, Louisiana. In preparation for tomorrow’s game, Lone Star Sports & Entertainment, ESPN Events and SMG are pleased to provide the following game day information. Ticket Sales – The Mercedes-Benz Superdome Box Office (Gate A Ground Level) will be open from 12:00 PM – 4:00 PM for ticket sales on game day. Gates B & H Ticket Booths will also be open on game day from 4:00 PM – halftime. Tickets are still also still available and priced from $40-$215 per ticket. Will Call – The Mercedes-Benz Superdome Box Office (Gate A Ground Level) will be open from 12:00 PM – halftime on game day. 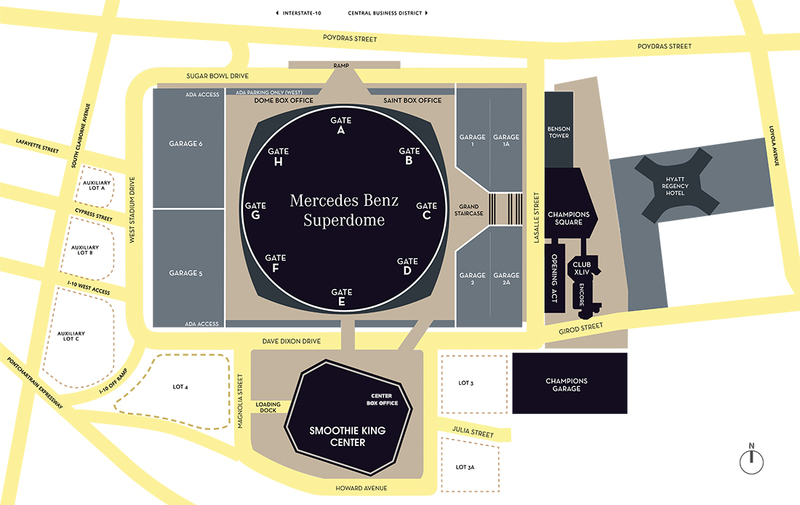 Mercedes-Benz Superdome – All gates at the Mercedes-Benz Superdome open at 6:30 PM. Champions Square – Champions Square will open at 4:30 PM for the Bud Light Fan Fest. Walk-through Metal Detectors – The Mercedes-Benz Superdome will use walk-through metal detectors at all entry gates to enhance safety and security. Prior to entering, guests are asked to remove cell phones, keys, cameras, and other large metal objects, and place them in the security bins. Do not remove belts, coins, jackets, wallets, watches or small jewelry. Bag Policy – The NFL Clear Bag Policy will NOT be in effect for this game. However, please note the following bag size restrictions. Bags cannot exceed 12″ x 12″ x 6″ per bag. Backpacks and oversized bags are prohibited. Express lanes are available at all entrances for guest without bags. NOTE: The State of Louisiana bans the possession of guns on the premises. All backpacks, animals (with exception of service dogs), large banners or banners in poor taste, bottles, cans, containers of any kind, contraband, large bags, laser pointers, noisemakers, outside food and drink, oversized packages, audio recording equipment, projectiles, mace, weapons and beach balls, and any other items deemed inappropriate by management are prohibited. No video cameras or cameras with professional lenses exceeding 6”. No GoPros. 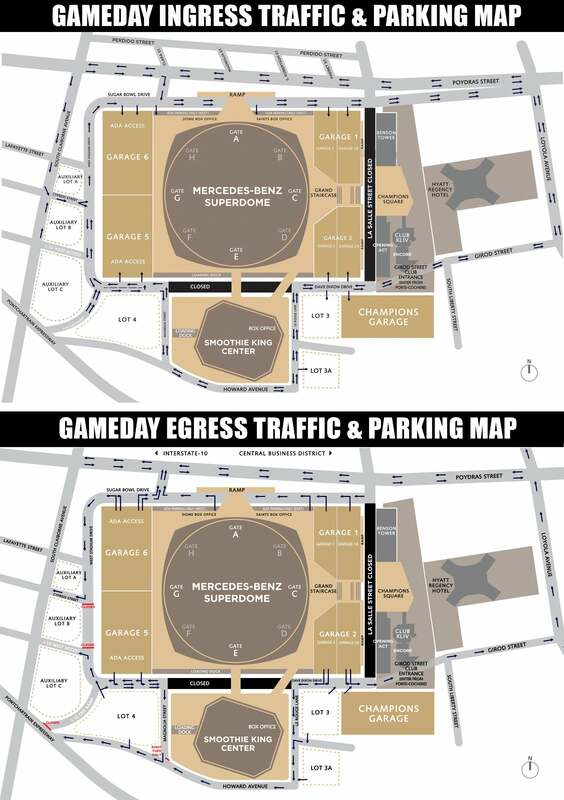 Patrons driving to the event should be aware that parking at the Superdome is limited. It is best to arrive early to secure a space at the Superdome, or allow for ample time to reach downtown New Orleans and find alternative parking. NOTE: Parking is CASH ONLY. To view Ingress & Egress Traffic Maps, click here. To view a map of parking garages and surface lots, click here. Get your game face on and join us in Champions Square before the AdvoCare Texas Kickoff in the Dome for Bud Light Fan Fest! This FREE and open to the public pregame starts at 4:30 PM and will include live entertainment, frosty drinks, and tons of food. With Champions Square being only a touchdown pass away from the Mercedes-Benz Superdome, it’s the place to get loud while celebrating before LSU & BYU kick off at 8:30 PM. Live Entertainment – Bucktown Allstars will excite fans with musical entertainment on the Champions Square stage starting at 6:30p. For more information on the Bud Light Fan Fest, click here. Lone Star Sports & Entertainment is an event management company founded in 2003 that is closely affiliated with the NFL’s Houston Texans. Since its founding, LSSE has established itself as the leading sports event promoter in Houston. In addition to the Texas Bowl and the AdvoCare Texas Kickoff, LSSE has emerged as a premier promoter for international soccer matches, including Copa America Centenario, the International Champions Cup, the 2010 MLS All-Star Game featuring Manchester United, the 2006 FC Barcelona U.S. tour, 2003 and 2008 matches between the United States and Mexico, and the 2005, 2007, 2009 and 2011 CONCACAF Gold Cups. LSSE has also reinvigorated the “Battle of the Piney Woods” rivalry between Stephen F. Austin and Sam Houston State and has promoted major concerts featuring country superstars including George Strait and Kenny Chesney. HOUSTON – Due to the devastating impact of Hurricane Harvey to Houston and the surrounding areas, the 2017 AdvoCare Texas Kickoff between LSU and BYU has been relocated to the Mercedes-Benz Superdome in New Orleans, La. Every ticket, parking and RV parking pass that was purchased for the game originally scheduled to take place at NRG Stadium in Houston will be refunded and processed by the outlet it was purchased through, including the schools, Lone Star Sports & Entertainment and Ticketmaster. Pre-sales for the game in New Orleans, La., including purchases through the participating schools, will begin Wednesday, Aug. 30 at 10 a.m. CT. Tickets open to the general public will go on sale Wednesday, Aug. 30 at 4 p.m. CT through Ticketmaster.com. Prices will range from $40 – $215 per ticket. Parking will be available only on gameday for $40 per space. The game will be played on Saturday, Sept. 2, at 9:30 p.m. ET/8:30 p.m. CT and televised nationally on ESPN.